For most of us, the very last thing we would ever want to do is cause harm to our fur babies, in this case, canines. I have now lived with a dog for over a year and only want to protect her. As health issues continue to rise in our four-legged companions, we need only look at a few factors to understand why and easily shift things to avoid potential health threats. Our homes offer the most hazards for exposure to toxins from wood and tile/linoleum cleaners and polishes to carpet deodorizers and emissions from air “fresheners” and candles. Any non-natural cleaners are to be avoided because if they walk upon it, lick it or inhale it; they are exposed to it. The concern carries over to include second-hand smoke and vapor from e-cigs too. 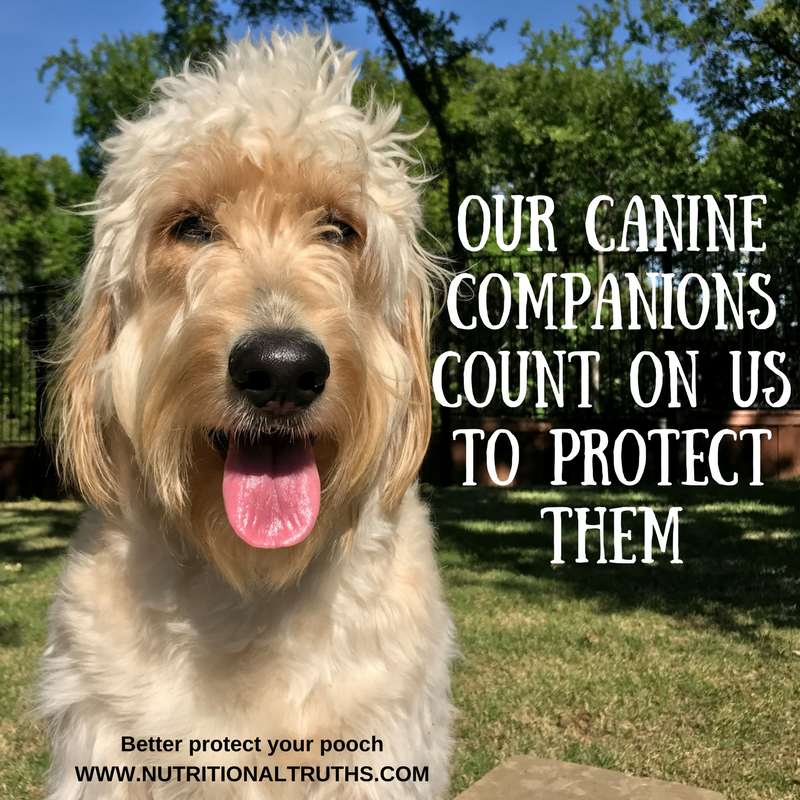 Most of us know about the dangers from a dog ingesting chocolate, grapes, onions, garlic, raisins, and human medications, but did you know that if you are feeding them canned dog food the BPA’s found in most can cause serious issues. Some companies offer BPA-free cans, but a fresh diet is best. Please note that rawhide treats are not safe for a dog of any size due to possible death by choking, intestinal blockage and poisoning. It is not a meat treat but rather a leather industry by-product, the backside of leather hides and are often finished with a myriad of non-food-grade glues. If you feed these to your dog or ever would, you owe it to all concerned to review it or investigate them further. Here is a terribly cute and effective video that explains it all. To view the video click HERE. Too many vaccines can cause harm as well, and you can investigate online to learn more but just know there is controversy around how much and how often some are given when a simple titer test could be taken to assess if your pooch has been effectively inoculated rather than over medicated. GMO ingredients in dog food should be avoided with the most coming through corn and soy grown in America. Also, canines require no grains in their diets, and some dog food companies use them as inexpensive fillers. Always buy the best food you are able/willing to, with no byproducts and a focus on meats and vegetables. Ever wonder why allergies in dogs have risen and it is often GMO’s and may be the same for humans. One of the largest culprits of exposing dogs to toxins is through fertilizers, pesticides, etc. used on grass, in gardens and carried in the water flowing next to curbs. Like humans, the dog can uptake whatever their flesh, including paw pads and nose, is exposed to as well as through licking and inhalation. In one study at Tufts, it was proven that a canines exposure to grass that has been professionally treated by a lawn care company increased their risk for death-inducing canine malignant lymphoma by as much as 70 percent! If your neighbor is having their lawn treated the drift of it into parts of your yard are very likely. Large parks, schools, apartments, etc. are potential toxic areas since so often they use poisonous products to treat the grass. Please investigate this further. I understand how much our canine companions mean to us and wanted to ensure that you knew what I did in how to keep your love healthier and safer. Happy Cinco-De-Mayo amigo and enjoy your weekend! 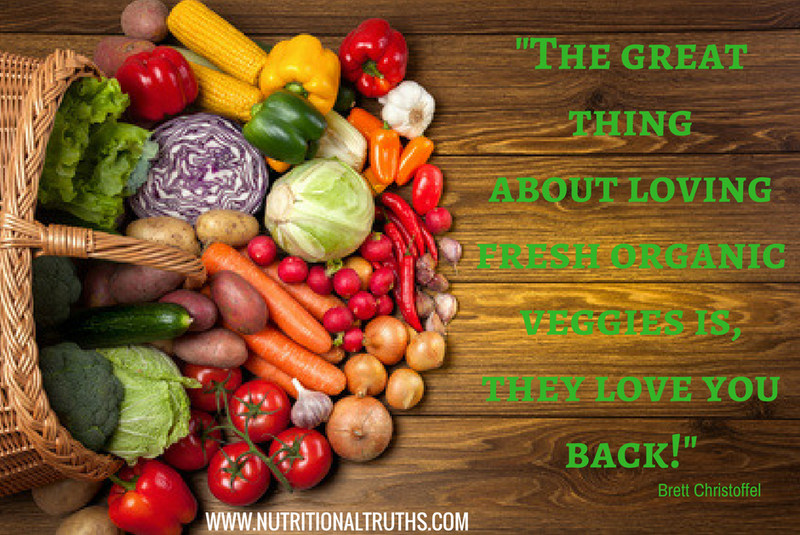 Feel free to follow Nutritional Truths here or on Facebook and share as you care to-Be well! Sometimes in life, we find ourselves on adventures we had not expected and my time with my father after a “terminal” diagnosis this past couple of weeks is no exception and by the way aren’t we all terminal? My father who I haven’t seen even a bit tipsy or otherwise hollered down from upstairs one night recently “Who’s downstairs!” I confirmed it was me and the next words out of his mouth were ones I never thought I would hear “I need my weed!” I laughed out loud and immediately knew I would have to blog about it. Dear old dad, a veteran of the Korean War who warned all his children long ago of the evils of drug use and how it was a gateway drug now, has embraced this safe and effective original medicine. He uses a Tootsie roll type of edible before bed to aid with sleep and ease leg pain through the night. Grateful Colorado had enough sense to see the value of God’s Farmacy and allow people access to non-toxic solutions to aid with a myriad of ills. Unlike synthetic petroleum-based solutions, there has never been a single overdose or death attributed to the use of cannabis. Tens of thousands of people die each month in America due to properly prescribed and taken pharmaceuticals as a side effect. Merck allowed over 50,000 people to die from using Vioxx before they took it off the market. If you would like to read the truth about why cannabis and hemp were made illegal then review: The Emperor Wears no Clothes, written by Jack Herer and all sixteen chapters are free on his site. I have asked Dad if he would be willing to try a little puff puff pass, but to date, he says no, I will keep working on him. He has shifted his consumption and begun several non-toxic protocols to combat his condition. Have a wonderful weekend, love on those you love, thanks for dropping in and feel free to share as you may. Be Well! I learned in the 80’s that one needed to avoid fats and cholesterol to avoid heart disease, cancer and the like. It turns out we have been lied to for fifty years because the sugar industry doesn’t want you to know that it is sugar and not fat that leads the charge in supporting disease. In 1967 the bogus study was published in the New England Journal of Medicine falsely linking fat to heart disease. Even after the truth of data manipulation came out this week in JAMA they deny any wrongdoing, but of course. 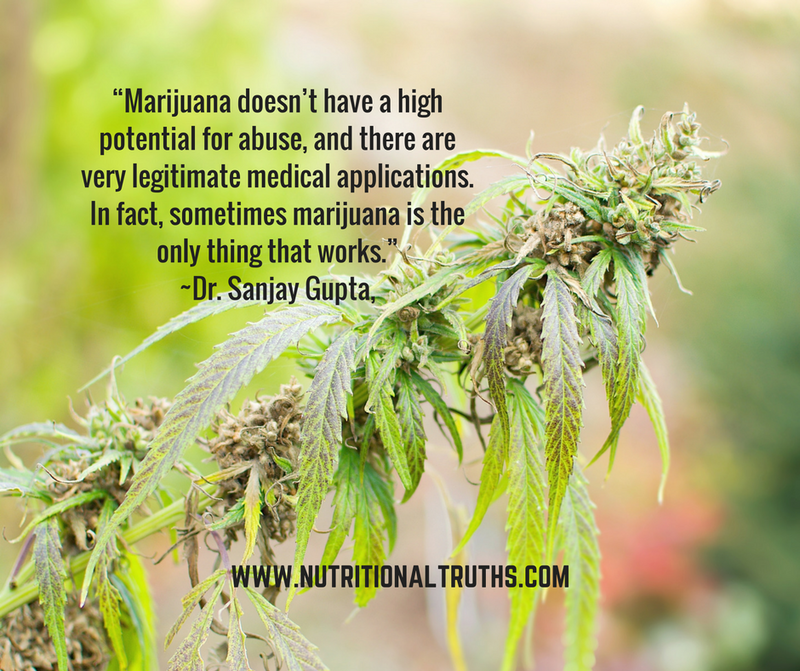 Not surprising after watching Dr. Lustig speaks to these deadly facts in his recorded presentation titled Sugar the bitter truth found on YouTube. Dr. Lodi also speaks to the fact that cancer cells take 19 times more energy than regular cells to operate, and their desired fuels source is sugar. What Is even crazier is that by them touting fat and not sugar as the culprit a whole new low-fat craze took place and guess what they replaced the fat with, sugar. This increase in the use of sugar by one-third, was known beforehand, and part of the reason for the lie. Without skipping a beat the new Sugar Association that replaced the old Sugar Research Foundation responded with the “that was before our time” response this week. They have held the same lies for years about sugar in sodas not aiding in the obesity epidemic. Sugar is what I refer to as America’s true gateway drug. Eight times more addictive than cocaine people will be slow to investigate it no matter how detrimental it is. Food manufacturers like cigarette manufacturers are prone to manipulate data and outright lie to protect and grow their market share. One day perhaps everyone will know the truth and act accordingly. OK probably not, but just the same, people have the right to know the truths about anything edible they purchase. 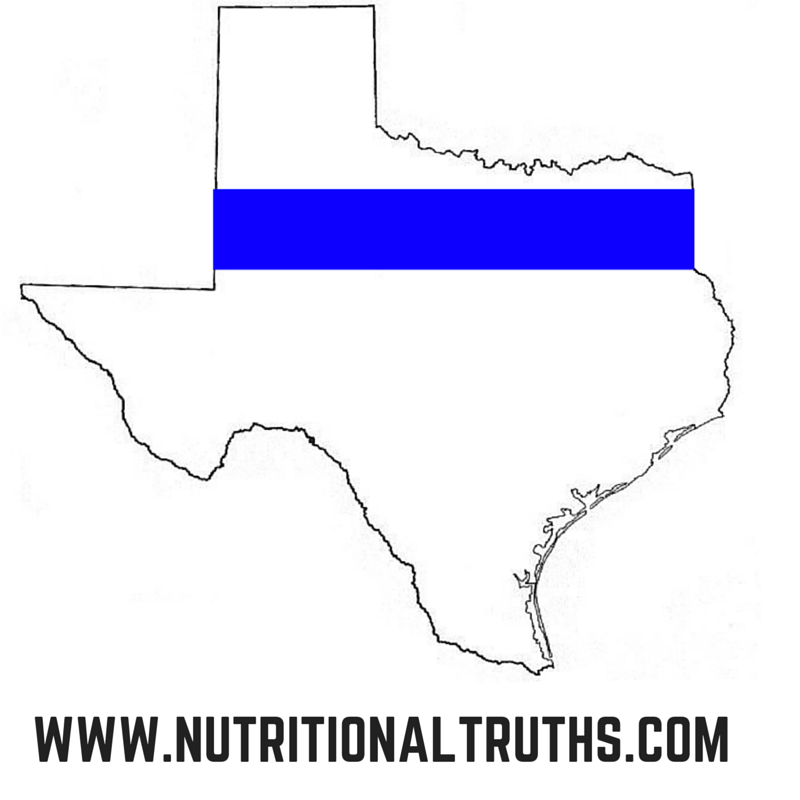 More information can be had in Nutritional Truths and by investigating it for yourself online. Have an amazing weekend, share as you may and Be Well! This once very full-time carnivore has been fading meat out of my diet for years and for various reasons. Wanted to share my experience without the intention of telling anyone what they should do. However, I do hope you find something in it that serves you well, welcome. For most of my life, I had consumed every manner of cow, pig, chicken, turkey or deer at every meal for over 40 years. I grew up in a culture like many of us where meat was the center of the meal all else were sides. “We are the top of the food chain, and besides we get all our protein from meat.” was the mantra. My initial decline started twenty years ago when I dropped frog legs and Cornish hens forever from my plate since they still looked too much like what they were. With meat mostly coming in the form of clean packages I was able to avoid giving thought to its origins. Fast forward to a few years ago and I had graduated to Meatless Mondays that started out as a single meatless meal once a week, and eventually, it became an all day thing. Add to this reading the China Study and watching Forks over knives and other like-minded documentaries and my thought process around meat and all food began to shift. Two years ago after I reviewed Earthlings by Mr. Phoenix, I realized the conditions the critters live and die in were often very unpleasant, and it rattled my growing sensitivities. 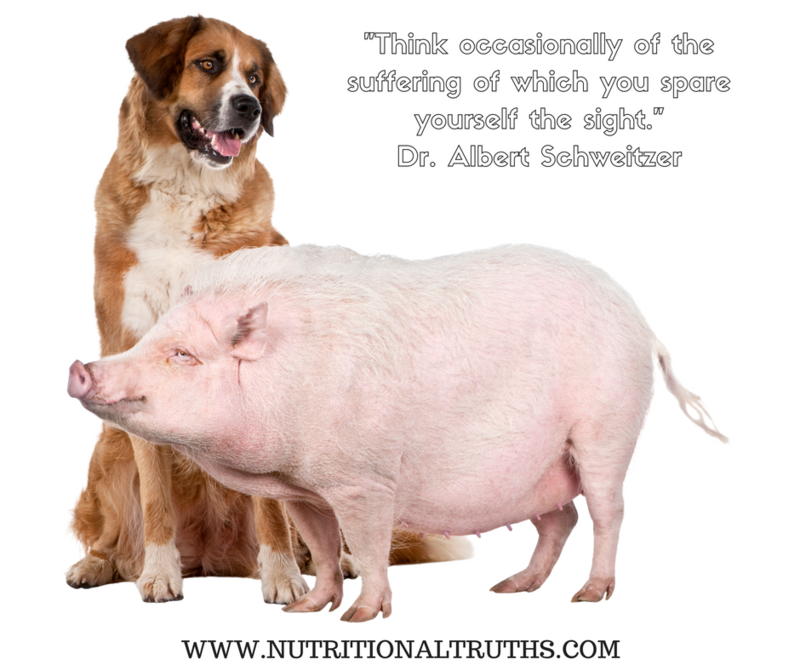 But I continued to consume chicken, turkey, pig, and cow only now every time I consumed them, I thought of them. I could not shake the growing awareness of these animals lives. Seven months ago a trip to the zoo brought me to the point where I realized I could no longer eat cows, pigs, chickens, turkeys, lambs, deer or goats. I have felt great about it, and those earlier conflicts are now gone. Learning to compartmentalize animals seems a cultural thing. These animals over here on the right we love and care for, and we have laws to protect them from abuse or any harm whatsoever, but these on the other side, we shall eat them. I have friends who have been vegetarian for decades, and I used to make fun of them, sorry about that. I no longer limit my beliefs around animals and food etc. and trusting the process seems to be where I now reside. Again, eat as you wish and there is much more to cover over the coming weeks around plant-based, Pescatarian, vegetarian and vegan diets. Glad you dropped in, enjoy your weekend, share as you care to and Be Well! Having chosen to forego today’s scheduled topic to say I back the blue. Real simple. Hemp. It does a body good! This weeks blog is early since it is Hemp Week and if you don’t already know all about it, read on! The first drafts of America’s Declaration of Independence and Constitution were written upon it, Henry Ford built a car from it that was fueled by it, and Washington and Jefferson both grew it. Cultivated for over 10,000 years it was the very first American crop to exceed $1 billion dollars. It can be made into over 25,000 different products including paper, plastics, textiles, paints, food, fuel, oils, rope, sails, etc. 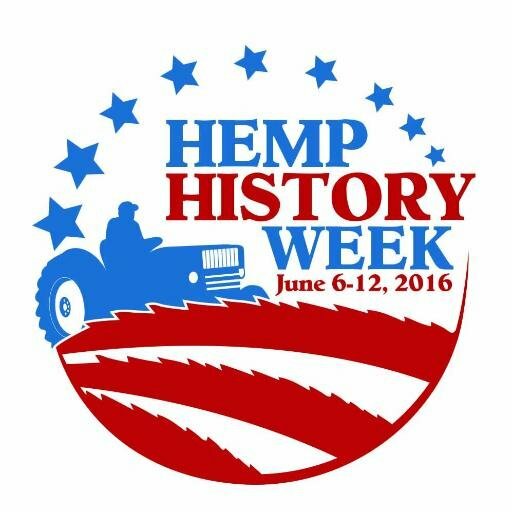 Hemp is one of our planet’s most amazing plants and June 6th through 12th is national hemp week! Industrialized hemp is not cannabis (marijuana), and no amount of smoking industrialized hemp can get you “high”. Prior to 1900, almost all medicines were cannabis-based as it contains proven healing properties from its THC, CBD and others. Legalization of many forms of cannabis has spread across the US. Today’s pharmaceuticals are reported to kill on average one person every 19 minutes for properly prescribed and taken medication, as a side effect. There has never been a single case of death due to cannabis or hemp, except for the times hemp rope was used in hangings. US 1914 $10 bill printed on hemp paper with image of hemp being harvested on the left. Government and corporate criminals stole hemp from the American people back in 1937 when they lumped it together with cannabis. Twenty years earlier the government had announced a program to focus on hemp cultivation rather than deforestation. However, folks with tree pulp processing patents, petroleum interests as well as massive tree-filled landowner/paper producers stood to lose a fortune from further embracing hemp. Corporations like Hearst and DuPont profited massively as a result of the Government making all-natural solutions illegal (see product list above) and allowing the patents of countless petrochemical based solutions (rayon, nylon, pharmaceuticals, etc.). A single acre of hemp produces the same amount of fiber as four acres of trees. A hemp crop can be grown three times in a single year while trees take 10 to 15 years to mature. Hemp requires no pesticides, half the water it takes to grow cotton, and will grow in all fifty states. We have been importing it from Canada, and we look forward to buying it locally sooner rather than later. Hemp is now being grown in America once again as the people regain the right to make the most of a natural and effective resource. The time has come for such a blatant misuse of government power and corporate corruption to cease so that all people will benefit. All parts of the hemp plant are used: the seed in shell is normally toasted; the center of the seeds or the hearts can be bought whole or in a powder form as protein and as an oil; the fibers of the plant can be made into paper, plastics, textiles, paints, oils, etc. The seeds contain all the essential amino and fatty acids that support optimal health. The seeds contain vitamins and minerals, Omega 3 & 6 Acids, in a perfect ratio of 1:3 to benefit our bodies and minds. Hemp also contains both Super Omegas Stearidonic Acid and Gamma Linolenic Acid, which allows the body easy conversion of all of its Omega 3 & 6 goodness. Hemp also requires no pesticides since it grows so tall and close together weeds cannot grow and it can easily be grown in all fifty states as it was before our government was purchased by private industry. If you investigate the facts further, you too will wonder how such a blatant series of lies have been told for so long to the American people. Based on results, hemp will make its way back as will cannabis, to be considered a norm in American society. I look forward to passing organic hemp fields growing as far as the eye can see. Knowing that it will create fuel, food, housing, and clothing. I go into further detail in my book Nutritional Truths. You can purchase hemp foods at healthful grocery stores or on Amazon. Please share this with those for whom you care. Till next week, Be Well! Few things come to mind faster than a pumpkin when it comes to thoughts of fall. A heavy fall crop, winter squash offers many variables and wanted to make sure you know how amazing it is for the body. Its history dates back over 10,000 years from an area between Guatemala and Mexico as a food source though originally it was just the seeds that were eaten as the flesh was thin and bitter. Christopher Columbus took them back to Europe where they began to be cultivated. A couple of the greatest things about consuming winter squash is that it is full of antioxidants and is an anti-inflammatory food of which we can never eat enough of. Full of vitamins A, C, B6, Manganese, copper, potassium, B2, folate, K, Omega 3 fats, magnesium, and B3. In addition to being a nutritional friend to our bodies winter squash also helps regulate blood sugar and insulin in addition to being an amazing source of fiber. Not prone to sharing recipes, I have to include this one as it is one of my favorites and is such a hearty vegan recipe that you have to try it! Feel free to make flavor variations that suit your taste. 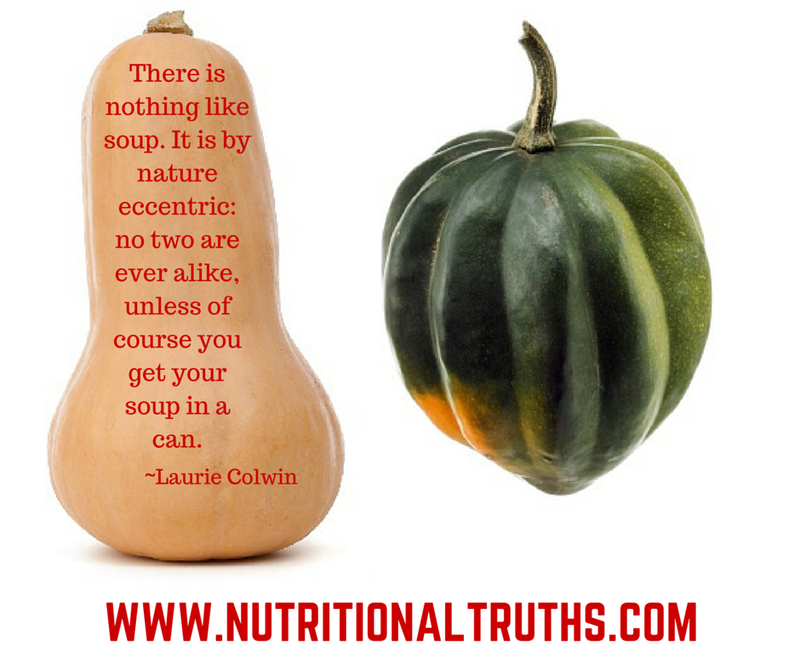 Have an amazing weekend, share if you like, eat some squash soon and Be Well! Cut squashes in half, clean out seeds, brush flesh with coconut oil and sprinkle salt, pepper and nutmeg. Place face down on a sheet pan and bake in the oven for 60 minutes at 350. In a high-speed blender puree the soaked cashews and coconut water for several minutes, set aside. In a stock pot place remainder of coconut oil and onion, cook 5-7 minutes till translucent, then toss in other spices and ground cardamoms and allow to sizzle for up to a minute. Add cashew mix and then add the flesh of both squashes. Once complete use an immersion blender to break things down as smooth as you like it, but not completely. This recipe delivers a thick and hearty soup and unless you’re dead set on a perfectly smooth soup try it with the small chunks in it. Top with freshly toasted pumpkin seeds and enjoy. This pot of soup serves several and if given an extra day for flavors to marry, all the better! The Deny Americans the Right to Know Act H.R.1599 was just approved by 275 politicians in the house. It keeps Americans from knowing about GMO’s in their food. H.R.1599 will ensure that labeling of GMO’s is never required and repeals the labeling already put in place in Vermont. It forbids states from requiring any labeling of GMO’s and there are many who benefit from this, though not the consumer. Genetically Modified Foods have been banned or restricted in over 50 countries including France, Germany, and Italy. The GMO crops introduced 20 years ago have required an extra 500 million pounds of herbicides to be used including Glyphosate (Roundup) that has been linked to the bee colony collapse and lowered numbers of monarch butterflies. 90% of Americans have said they want to know what is in the foods they are buying. 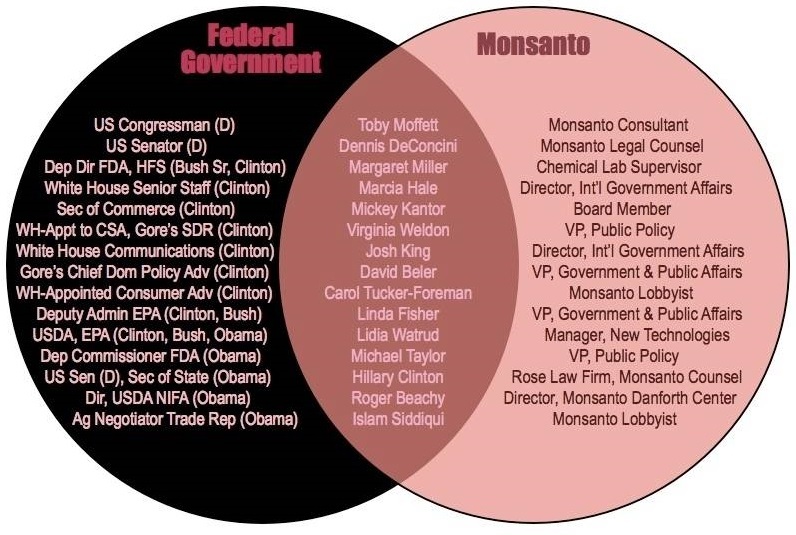 If folks understood all the risks and dangers of consuming GMO’s this would not be allowed to happen. Good thing it’s baseball season and along with summer’s heat can keep folks distracted. If your still not clear on how prominent GMO’s are see here: 88% of all corn grown today is GMO, 94% of all soy is GMO, 87% of rapeseed or canola is GMO, and sugar beets are just over 50% GMO crops. And although we don’t eat it 88% of all cotton grown is GMO. 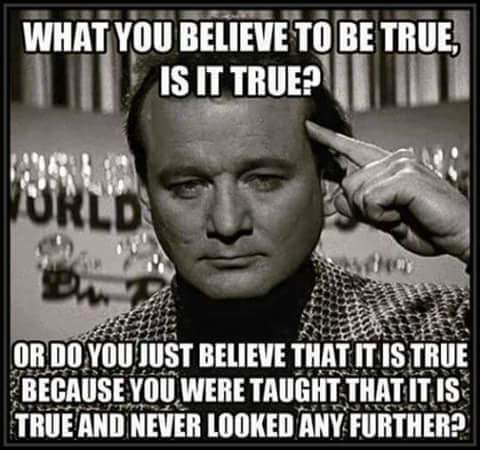 Investigate it yourself to learn more. It now goes to the Senate for a vote, feel free to reach out to your Senators and let them know your thoughts on the issue. I used to think a politician’s role was to look out for their constituents. Things aren’t always as they seem and be sure to eat organic when possible. The audio version of Nutritional Truths is still being edited and should be out by months end. Feel free to share this with others and Be Well! The first drafts of America’s Declaration of Independence and Constitution were written upon it, Henry Ford built a car from it that was fueled by it, and Washington and Jefferson both grew it. Cultivated for over 10,000 years it was the very first American crop to exceed $1 billion dollars. It made over 25,000 different products including paper, plastics, textiles, paints, oils, food, rope, etc. 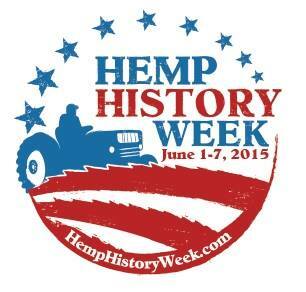 I am speaking today of hemp, as it is one of our planet’s most amazing plants & this is national hemp week! Industrialized hemp is not cannabis (marijuana), and no amount of smoking industrialized hemp can get you high. Prior to 1900, almost all medicines were cannabis-based as it contains proven healing properties. Legalization of many forms of cannabis has spread across the US. Today’s pharmaceuticals are reported to kill an average of one person every 19 minutes. There has never been a single case of death due to cannabis or hemp, except for the times hemp rope was used in hangings. If you investigate the facts further, you too will wonder how such a blatant series of lies have been told for so long to the American people. Based on results, hemp will make its way back as will cannabis, to be considered a norm in American society. I look forward to passing organic hemp fields growing as far as the eye can see. Knowing that it will create fuel, food, housing, and clothing. I go into further detail in my book. You can purchase hemp foods at healthful grocery stores or on Amazon. Please share with those for whom you care. Till next week, Be Well! Many times have I taken a bite of something and think “Wow this is amazingly delicious”! and today I quickly realize it is likely MSG talking. Almost all processed, fast and restaurant foods are laden with it. Since it comes in our food supply in over sixty different names, you would need to keep a cheat sheet with you to avoid it. Preparing food at home with all known ingredients is the only way to skip it consistently. The folks in our military at the end of the second world war noticed how much tastier the Japanese MRE’s were than Americas and learned all about MSG. In the beginning, they thought they could add an MSG shaker on tables across America like salt and pepper but it never took off. Once food manufacturers knew how it helped drive their sales by tricking consumers into not tasting the negative flavor found in many packaged foods, sales of it took flight. They have been increasing its use and even turned to hiding it under various ingredient names ever since. What many may not know is that feeding lab rats MSG is the standard protocol to fatten them. Seems rats aren’t regularly overweight, but if you feed them MSG they are guaranteed to become obese. 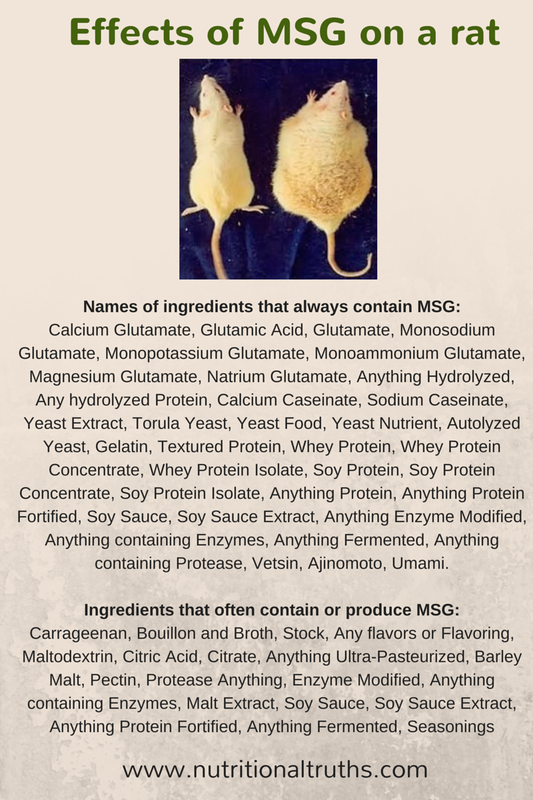 Of course, all food manufacturers and fast or full-service restaurants know this, but MSG also keeps customers loving the food and keeps them from feeling full so that they will consume more and regularly. A simple look at Americas statistics around our growing obesity over the past fifty years proves this out. Next time you find yourself overwhelmed with taste-joy over something, stop and realize if you’re being duped. Some folks consider this a drugging of the food while others consider it food science. We will all eat whatever we choose, and that is as it should be. At the same time, you have a right to know if they are intentionally flipping switches in your brain to get you to love it and eat more. One of many ingredients, it pays to be clear on and in Nutritional Truths I cover them all. Along with paperback, it is now on Kindle, and we will go into the studio soon to make it available in audio. Be well!